Underlying the ongoing battles over the federal budget and the nation’s debt ceiling is a bipartisan agreement among Americans that reducing the deficit is a top public priority. But, just as our polling found that most Americans support political compromise but not on issues they care about, the devil is in the details when it comes to how to reduce the deficit. 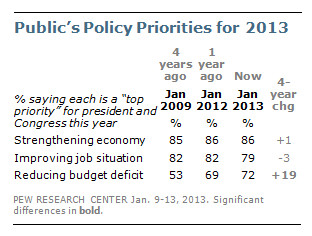 Each year, the Pew Research Center conducts a survey in January asking Americans what should be the top priorities for the President and Congress in the coming year. Reducing the federal deficit was cited by 72%, representing a 19-point increase over the 53% who named it in 2009 when President Obama began his first term. Only strengthening the economy (86%) and improving the job situation (79%) topped it. Big majorities across partisan lines agreed on the deficit issue as a priority: Republicans (84%), Democrats (67%) and independents (71%). Another survey, conducted in February, found that 70% of Americans said it was essential for the president and Congress to act on major deficit legislation this year. Again, there was agreement across partisan lines: Republicans (81%), Democrats (65%) and independents (70%). But that’s where agreement ended. In 16 of 19 areas asked about in the February survey, Republicans were more likely than Democrats to support spending cuts. Beyond partisan differences, the survey also illustrated the difficulties in generating public support for specific budget cuts. For 18 of 19 programs tested, majorities wanted either to increase spending or maintain it at current levels. The only exception was assistance for needy people around the world where 49% wanted to increase spending or keep it the same, while 48% wanted to decrease it.